Jimmy Choo, fall 2001 collection. London, 1984; established custom shoe business, 1988; debuted wholesale shoe line and opened London boutique and showroom, 1996; niece Sandra Choi named creative director; established Jimmy Choo USA; opened New York and Beverly Hills stores, 1998; opened in Las Vegas shop, 1999; scouted further U.S. locations and Asia for additional stores, from 2000; opened new London store, 2001. Exhibitions: Fashion in Motion, Victoria & Albert Museum, London, 1999. Awards: British Accessory Designer of the Year, 1999. Address: 6 Pont Street, London, England, SW1 X9EL. Website: www.jimmychoo.com . O'Keefe, Linda, Shoes, New York, 1996. Steele, Valerie, The Fashion Book, London, 1998. ——, Shoes: A Lexicon of Style, New York, 1999. Gurevitch, Ruth, "Choo's New Shoes," in Footwear News, 5 August 1996. Anniss, Elisa, "Designing Superstars," in Footwear News, 26 May 1997. Hesson, Wendy, "Jimmy Choo Struts Across the Pond," in WWD, 16January 1998. "Choo Prepares for U.S. Olympic Tower Store," in Footwear News, 2November 1998. Ginsberg, Merle, "The Red Carpetbaggers," in WWD, 22 March 1999. "Choo's Shoes," in the New Straits Times, 7 June 1999. Parrott, Stuart, "The Girl From Uncle," in Asia, Inc., August 1999. Fallon, James, "Liberty Bets on Women's," in WWD, 22 September 1999. Edelson, Sharon, et al., "Excess Evolution," in WWD, 11 February 2000. De Courtney, Romy, "The Big Preen," in WWD, 27 March 2000. Conway, Susan, "High Heal Factor is Feng Shui in Choo's NewShoes," in The Guardian, 14 September 2000. Miller, Samantha, "Shoes? Choos! Jimmy Choo Footwear Designer Sandra Choi…," in People Weekly, 20 November 2000. Seckler, Valerie, "Give 'Em Shell," in W, December 2000. ——, "Alter Egos," in W, January 2001. ——, "Last Look," in Vogue, January 2001. Medina, Marcy, "New Best Friends," in WWD, 8 January 2001. Seckler, Valerie, "Oscar Scoops," in WWD, 26 February 2001. Greenberg, Julie, and Leonard McCants, "Concerns Aside, Fall Gets Going," in WWD, 27 February 2001. Seckler, Valerie, "Net-a-Porter Adds Jimmy Choo," in WWD, 28March 2001. McAlister, Maggie, "Fit for a Queen…," in Footwear News, 2 July 2001. Had Jimmy Choo been a resident of Oz, Dorothy's slippers would likely have sported genuine rubies. No stranger to extravagance, Choo is legendary for elegant, imaginative shoes. The sandals he fabricated for a Vogue photo shoot displayed 30-carat diamonds and carried a price tag of $1 million, and Cate Blanchett's 1999 Academy Awards footwear featured diamond ankle straps and cost a mere $110,000. Jimmy Choo is actually two distinct enterprises. 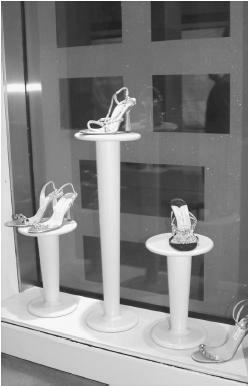 Choo heads the exclusive couture company that produces only three or four hand-made pairs of shoes per day. His customer list reads like a Who's Who of actresses, royalty, and the rich and famous. Wealthy feet from all over the world have found their way to this master craftsman. The late Princess Diana owned more than 30 pairs of his shoes, and the beauty and elegance of his footwear are believed to have helped create Diana's sexier image. Born to a shoemaking family on the Malaysian island of Penang, Choo made his first pair of shoes at age 11. 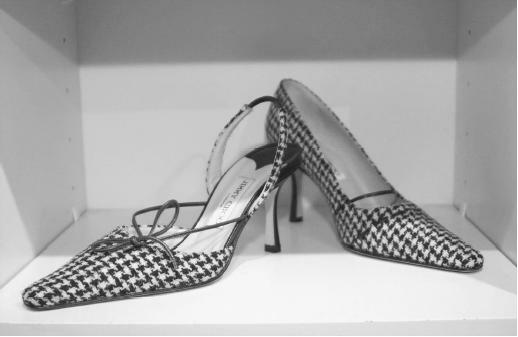 He attended Cordwainer's Technical College in London and is considered one of London's leading shoe designers. His excellence earned him the title of British Accessory Designer of the Year in 1999. Choo favors crystalline colors, aqua, fuchsia, and bright orange and applies them to luxury fabrics like silk satin and shantung. Python and fish skin are some of his favorite materials because of the way they accept dye, and mink and feathers grace some of his styles. He has used a wide variety of stones, from Swarovski crystals to natural crystals for their healing power. His stiletto heels have been described as "dainty and deadly." Choo's philosophy is that shoes can be both beautiful and comfortable, and his devotees prove the point by their nearly fanatical devotion to his footwear. Fashion stylist Tamara Yeardye Mellon of British Vogue approached Choo about starting a ready-to-wear business, having realized the tremendous potential for mass-market high-end foot-wear. The company opened in 1996 on Oxford Street in London with Choo lending his name and becoming a silent partner while Mellon served as managing director. Choo's 26-year-old niece, Sandra Choi, joined the firm as creative director. Choi was raised in Hong Kong and spent a year at St. Martin's Art School while living and working with her uncle. The demands of his custom work were such that she chose the business over formal education and left school to devote all her energy to the new company. Choi has achieved tremendous success in her own right and a strong following that includes everyone from Madonna to the Bush twins. Though not custom-made, the Jimmy Choo line is all fabricated in Italy with an eye toward top quality. The collections are shown twice a year to coincide with the designer fashion shows in Paris, Milan, London, and New York. The company also offers men's shoes, handbags, and small leather goods. Choo has freestanding stores in London, New York, Las Vegas, and Beverly Hills and is carried in luxury retailers such as Neiman Marcus, Liberty of London, Bergdorf Goodman, and Harrods. It has become one of the largest off-the-shelf luxury shoe companies in the world, with prices running from $300 to $1,600 per pair. In a very short length of time, Choo is selling almost as many pairs of shoes as his major competitor, 30-year-old Manolo Blahnik.